On Libido naturally corrects imbalances that may be robbing a woman of her desire for sexual intimacy. THESE STATEMENTS HAVE NOT BEEN EVALUATED BY THE FOOD AND DRUG ADMINISTRATION (FDA). THIS PRODUCT IS NOT INTENDED TO DIAGNOSIS, CURE, MITIGATE, TREAT, OR PREVENT ANY HUMANS AND/OR ANIMALS DISEASE. THE INFORMATION AND PROCEDURES CONTAINED HEREIN ARE NOT PRESENTED AS MEDICAL ADVICE NOR SHOULD IT BE USED AS A SUBSTITUTE FOR CONSULTATION WITH A QUALIFIED HEALTH CARE PRACTITIONER. Ingredients: Water, Coco-caprylate/Caprate, Cetearyl Alcohol, Cetearyl Glucoside, Stearyl Alcohol, Propanediol, Phospholipids, Dehydroepiandrosterone (DHEA), Tribulus Terrestris, Saw Palmetto Berries, Mucuna Pruriens, Epimedium Sagittatum, Maca, Muria Puama, Safflower Seed Oil, Evening Primrose Oil, Lecithin, Gluconolactone, Sodium Benzoate, Potassium Sorbate, Honeysuckle, Red Beet Extract, Annatto Extract, Dimethicone, Rosemary Extract Oil. 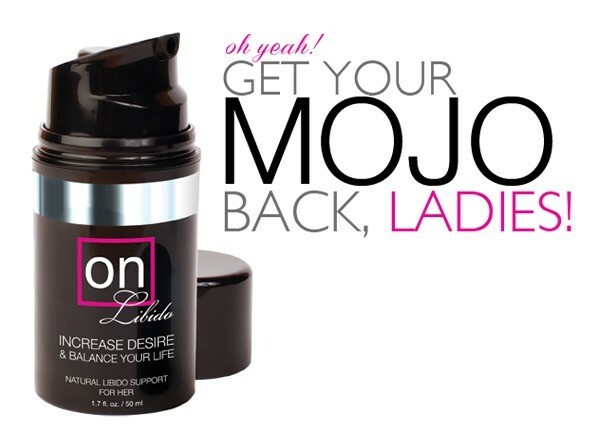 On Libido cream contains the purest herbal extracts and utilizes a highly effective liposome carrier system for a powerful synergistic formula. Paraben-free, No animal testing. Suggested Use: Apply daily. Massage one or two pumps onto chest, abdomen, inner arms, or thighs. Not a lubricant. For external use only.